Adsense:How to avoid clicking on your own ads and impressions ? All Adsense publishers know that clicking on your own ads and impressions generated while loading your own web-pages/blog are violation of Google AdSense Program Policies. Sometimes you may click your own ads by mistake or impressions may generate while you test your blog or website. There is one simple solution for Adsense publishers to avoid these problems. Add this line shown below to 'C:\Windows\System32\drivers\etc\hosts' and save. Now system will redirect all request to Adsense's ad server to your own system. 2). 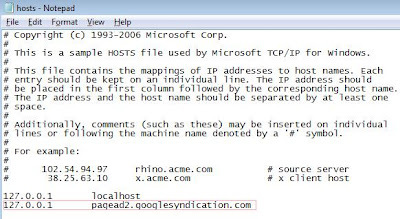 Copy paste this line shown below to the address bar of the folder. 3). Then 'Open With' window will pop up. 4). Select 'Notepad' from the list. 5). Copy paste this line to opened file and save as shown in the picture. ( ** Tab space between 127.0.0.1 and pagead2....). 6). Restart your browser. [Repair your Network or restart your computer if required]. Open your browser and check you site, No Adsense ad will load to your browser. Now no fear of Adsense policy violations. ** Do not remove any lines inside 'hosts' file..